Each frame is .1 seconds apart. In this event, Lenny Krayzelberg recorded a time of 53.72, a new Olympic record. At this stage of the race, the swimmer rated 50 full left-arm strokes per minute, a very high rate for such a large man. The numerals in the window of each frame are the actual times in the race for the action depicted. Frame 39.6: The left arm enters too far behind the head. This position will require a lateral movement to reposition the arm to where it can apply propulsive force. The right arm is executing a strong inward and upward sweep from deep below the swimmer. 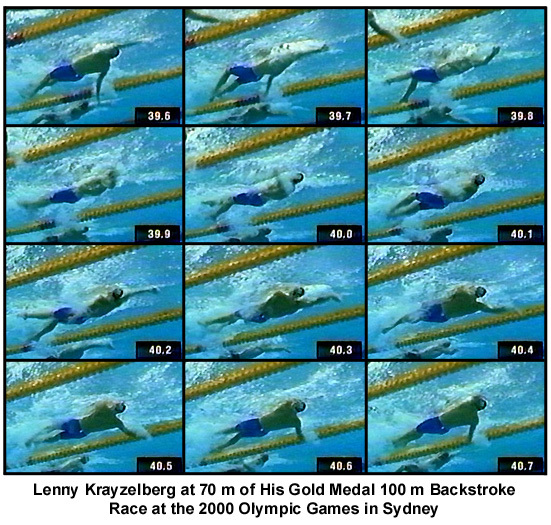 A very fine feature of Lenny Krayzelberg's stroke is his streamline. His hips always remain high, the shoulders and back are low, and the head is well back. The flatness of the swimmer's back is a fine demonstration of backstroke streamline. Frame 39.7: The left arm presses sideways. Time has been lost because of this extra unproductive movement. The right arm continues its inward sweep. The left leg kick is worth noting. Instead of holding the thigh parallel to the water surface, the knee is raised as the joint is flexed. This allows the lower leg and foot to kick backward and upward without dropping low and creating a large increase in cross-sectional area. Frame 39.8: The left arm begins propulsion with a classic bent elbow, some medial rotation of the upper arm, and the commencement of upper arm adduction. Frame 39.9 to 40.1: The propelling left arm pushes mostly backward. The forearm and hand is the propelling surface. The turbulent drag pocket on the back of the lower arm obscures details of the arm position. Excellent streamlining is maintained. Frame 40.2: The right arm enters much wider than did the left arm. It immediately orients backward with wrist flexion. The left arm produces an inward sweep to finish the stroke, but one that is not as extensive as that of the right arm. Frame 40.3: Adduction of the right arm begins before the elbow is flexed appropriately or the upper arm is medially rotated. This will result in an arm sweep that is wide, involving more lateral force development than is necessary. Frame 40.4: The wide sweep of the right arm is clearly shown. An extensive shoulder and hip roll to the right counter some of the lateral force component. The swimmer's great streamline is obvious in this frame. Frame 40.5: The deep roll to the right side contributes to the wide and deep long-arm sweep. Frame 40.6: The deep right shoulder keeps the hand deep in the water. The hand/forearm-propelling surface has produced considerable drag turbulence. Frame 40.7: The end of direct propulsion with the right arm is reached. The stroking cycle restarts. Lenny Krayzelberg's streamline and rate are his greatest assets. A seemingly good left arm pull is paired with a right arm pull that is perhaps too wide. The right arm requires a better setup before adduction.